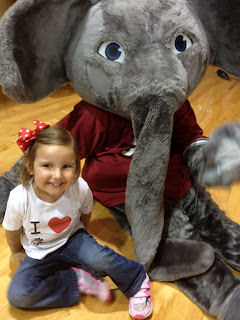 What a fun day Gracie and Momma had yesterday! Blake and I decided to keep her home to keep her healthy before her surgery next week, but that doesn't mean we have to stay coped up all day! Hopefully we didn't over do. 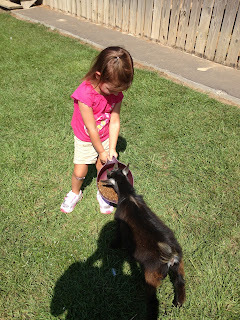 Gracie did not like feeding the big animals but this baby goat was a perfect size. Pigs are her favorite animal and she loved feeding a bottle to this baby pig. 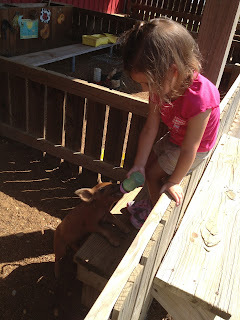 She was not a huge fan of the pig jumping on her though. 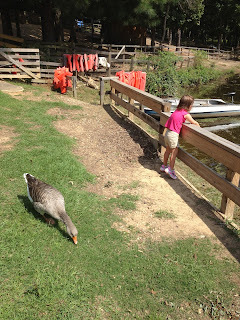 Our favorite thing was feeding the massive fish and the ducks. We could have thrown bread in the water all day long but we had a busy schedule ahead! Gracie had about 1.5 inches cut off her hair yesterday. 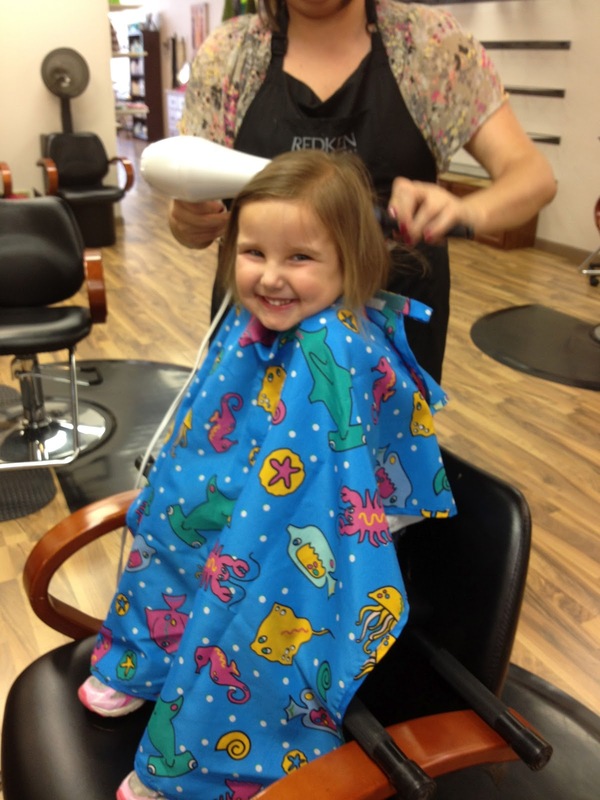 She was a good girl and loves her new do. 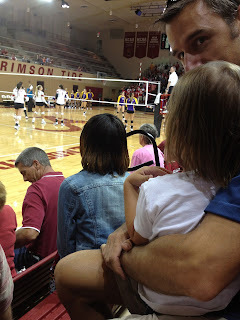 We had Chick-fil-A Day at the Volleyball game vs. LSU ! We gave away 200 sandwiches to the first 200 fans and lots of appearances by the cow. Gracie insisted on passing out the sandwiches and even said "My Pleasure" several times. It was a super fun night! If you haven't made it to a volleyball game at Fosters Auditorium, I recommend it. I have read and prayed over this scripture multiple times this week. I keep getting pulled back to it. Again and Again and Again. Am I a sheep? A goat? How do I want the Father to look at me on judgment day? Is He going to say congratulations on winning Champion's Club in 2011? Congrats on being elected to the Chamber board of directors? NO! All of my many accomplishments that I am so proud of this year mean nothing in eternity. What I should be most proud of is the opportunity to just love and hug on people in China. And the meansy God gave me to donate thousands of dollars of chicken after the tornado. Those were lasting.... This year, my New Years resolution. To live this scripture. To slow down long enough to see Jesus in "the least of these." To invite someone into my home, clothe someone, offer the shoes off my feet and the coat off my back. Give a Father to the fatherless and hope to the hopeless. How will the Lord use me? I won't know until I surrender. I surrender Lord. I know that getting closer to God's heart is going to be uncomfortable and inconvient. It will be messy and dirty. Not once in the scripture have a found anything that promises a comfortable life. Jesus promises his followers a lot of things, but I have to find where he warns us to be safe and comfortable. I am far more afraid of living a comfortable life and failing to follow Jesus than I am of any illness or loss of time and money. I always feel a little let down when Christmas is over. We get hyped up for Christmas for over a month and then its over! I admit that we left our decorations up longer than is "socially exceptable." My darling and wonderful husband took all the decor down and put it in the attic while I was at work one day this week. What a nice surprise to come home to! I read her the Charlie Brown Christmas book and one of my favorite parts is when Charlie Brown sees that Snoopy has decorated his dog house in lots of lights and he throws back his head and yells, "Even my dog has gone commercial!" Everytime I read that page G asks me, "Why is he crying?" I respond every time with, "He believes there is more to Christmas than lights and big trees."